At the time I was in my twenties. I'm not anymore, in fact that cake up there was to celebrate yet another birthday into my thirties. Sean and I called an apartment our home back then; we don't anymore. It was in the city where he grew up. We don't live there anymore, either. I worked at a job that had me in a windowless office. Scratch that, there was a window but it was blocked from easy view by a bookcase taller than me. I could see a slivered glimpse of an interior courtyard by leaning all the way back in my chair and scooting over to the left. That's changed too — I've not sat in that chair or stood in that room in six years. I couldn't have imagined these 2,557 days since that apartment, that career, those first words. I knew Sean was the finest man I could ever hope to marry, so that was a strong beginning. Over the years we moved, and moved again. We left things behind and gained so much. When we moved here, to the city where I grew up, things had changed, were changing. I got to know new neighbourhoods, new shops, new people. I learned to live in a place I thought I knew, as an adult and a parent. We settled in and stretched out and explored. One of the elementary schools I had attended closed, torn down to its foundations and then paved over for townhouses. When I pass that corner I think about the sturdy, square building that used to stand there. I think of how the thin heels of my loafers would often hook the edge of the stairs when I'd run from our classroom up on the top floor down to the room on the bottom where we had assembly. I remember the sound of chairs scraped across linoleum and the crumpled paper of packed lunches. I think of all the childhood, childlike dramas and tragedies that took place with those halls as backdrop, the stage now cleared. We went to my high school's anniversary. The halls seemed wider. I recently spent a day in truly windowless room. It happened to be that day in spring when the trees pop, and the leaves go from frilled curls to full spread. That blink-and-you'll-miss-it day. Keeping occupied over hours of waiting, Sean and I reached the topic of Jack Kerouac and On the Road, specifically the original text versus as it was published by Viking in 1957, with names changed and sections removed. Kerouac put On the Road to paper over a span of three weeks in April 1951. Three weeks! He worked it out on a manual typewriter, taping sheets of teletype paper together so the resulting roll could be fed into the machine once, and he could then go from there continuously, uninterrupted. The manuscript is single-spaced, without paragraphs or breaks, a solid block of text with the words stacked like bricks in pavement, one hundred and twenty feet long. Edits are in pencil. Kerouac didn't write a book; he told a story. Starting at the outset and working his way to the conclusion. A book written in three weeks makes a great headline. It's a headline that swaggers, full of bravado. That said, what catches me are all the years that built those twenty-one days. Kerouac had a famous habit of notebooks, of scribbling and collecting stories as he went — like those pebbles that you kick around for a while before picking them up — he tucked them in his pockets in between pages. He began writing On the Road as Sur le Chemin, in colloquial Québécois French, three months before he started the scroll. I like that. I like the idea that even a work known for the spontaneity of its prose — one that reads like a singular act of improvisation — could have begun in fits and starts. I like that, for even him, it can take some time to get one's mind around things. We may need to circle our destination, figuring out how best to approach, from what angle, and where to land. In a beautifully fitting twist, Kerouac's scroll is jagged and torn at the bottom, the end ripped away. And so, his finale, in its original form, is a mystery. The margin reads, "ate by Patchkee, a dog", which may or may not be the truth, which could very well be a joke, but it is another thing I like. Endings are often messy. They smudge and smear into the next beginning as everything starts again. Endings follow along, trailing behind forward progress, like the echo of your own footsteps. So here we are, with the trees heavily green and mornings still cold. We've made some headway, the first seven years done, with still a ways ahead. (Seven is a number that's important to me, as you might have guessed.) That milestone passed, this road has been an exceptional one to travel thus far, and I'm looking to the horizon, looking to reach the rim of its curve and then drive past it. Thank you, thank you for the company. Let's get going on the next seven. I'll bring the cake. *If you follow that link, it's rather empty, save for a comment made by Tarasome years later; she's a treasured friend and I'm happy that she's there, Anne and Diana are we. However, the quiet there is a bit misleading; when I transplanted this site from another space to this one, the comments from those early posts did not come along. I have them saved though, and if I can figure out a way to respost them I will, as I am, still and always, grateful for the welcome and continued friendship from this community. xo, all. In other business, we have the UPPERCASE winners — congratulations Melinda and Jade! I'll be in touch soon. Think of this cake as a gussied-up version of a Victoria sponge. The flavours are the same, as we've got the well-worn charm of strawberry jam, lemon and (butter)cream. Folding beaten egg whites into the batter, as done with chiffon cakes, results in an airy, delicate crumb. I've gone and mussed up that delicacy a little with ground hazelnuts, but I think the modest sacrifice in height is worth it — the cake has fluff but also has enough structure to stand up to the rich weight of the preserves, and it's still plenty tall. I also happen to think that the teensy flecks of gold and brown look pretty, so there's that, too. 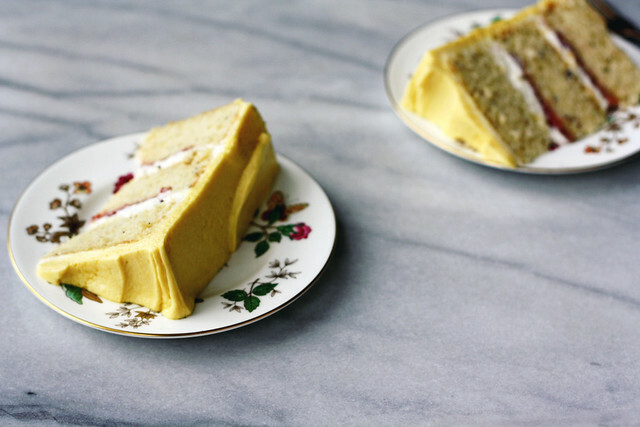 The layers are adaptated from the Fluffy Yellow Layer Cake in The Cook's Illustrated Cookbook (America's Test Kitchen, 2011). The cake uses 6 yolks and 3 egg whites, so be sure to keep those extra 3 whites aside if making the Swiss Meringue Buttercream. Preheat an oven to 350°F (175°C). Grease three 8x2-inch pans with softened butter. Line the bases with parchment paper, grease the parchment, then dust bottoms and sides with flour, tapping out excess. Set aside. In a food processor fitted with the metal blade, grind the hazelnuts into a fine meal. Stop the machine, scrape down the sides and pulse again one or two times. You should have about 1/2 cup hazelnut meal. In a large bowl, whisk together the ground hazelnuts, cake flour, baking powder, baking soda, kosher salt and 1 1/2 cups of granulated sugar. In another bowl, or a jug with a pouring spout, whisk together the melted butter, buttermilk, neutral oil, vanilla extract and egg yolks. Set aside. In the bowl of a stand mixer with the whisk attachment, beat the egg whites at medium speed until foamy. Sprinkle in the cream of tartar. Increase the mixer speed to medium-high, and with the machine running, pour in the remaining 1/4 cup granulated sugar in a steady stream. Continue to beat until the egg whites are glossy and stiff peaks form, about 2 to 3 minutes. Using a rubber spatula, scrape the egg whites into a bowl and set aside. Add flour mixture to the now-empty mixer bowl. With the machine running on low speed, slowly pour in the buttermilk mixture, stirring until just incorporated, around 20 seconds. Stop the machine, scrape down the sides of the bowl and whisk again until there's no visible flour, around 15 seconds more (note: due to the hazelnuts, this batter will not be completely smooth). With a rubber spatula, stir 1/3 of the beaten egg whites into the batter to lighten. Add 1/2 of the remaining whites and fold gently until almost combined, a few white streaks can remain. Add the last of the whites and continue to fold until no streaks remain. Divide the batter evenly between the prepared cake pans. Tap the pans gently on the counter a few times to release any large air bubbles. Bake layers in a preheated oven until the cake begins to pull away from the edge of the pan and a cake tester (toothpick) inserted in the centre comes out clean, around 20 minutes. Cool cakes in pans on a wire rack for 10 minutes. Loosen the edge of the cakes with an offset spatula or butter knife, then invert onto a wire rack lined with clean parchment and remove the baking parchment from the bottom of the layer. Invert the cake again onto a greased wire rack and cool completely before filling and frosting, at least 2 hours. To assemble, mix the strawberry preserves with the lemon zest in a bowl. Stack and fill the cakes, dividing the jam between the cake layers and topping each with thin coat of buttercream. Use the remaining buttercream to cover and decorate the sides and top to your liking. For a tutorial on filling and frosting a cake, see here. Makes 1 8-inch, three-layer cake. The ground hazelnuts can be substituted for an equal amount other ground nuts — almonds, walnuts or pistachio are winning bets. Or, if not your thing, omit nuts altogether and make up the difference with an equal amount (2 ounces, 1/2 cup) of sifted cake flour. The cake layers can be made a day ahead and kept at room temperature overnight, wrapped well in clingfilm. As pictured, I used three 6-inch pans, baking the cakes for around 25 mintues. 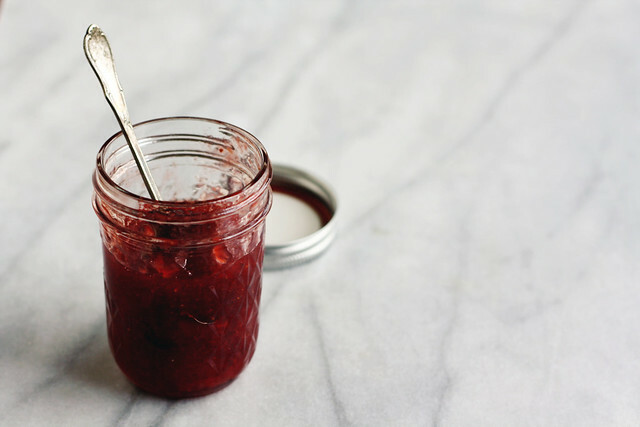 I use a chunky, homemade strawberry preserve, one that's not particularly sweet as far as jams go. If yours is on the sweeter side, you might want to pull back to 1/2 cup total. Also, keep in mind that a thick layer of jam will cause the cake to slide when stacked, so err on the side of miserly. This cake plays well with other frostings. 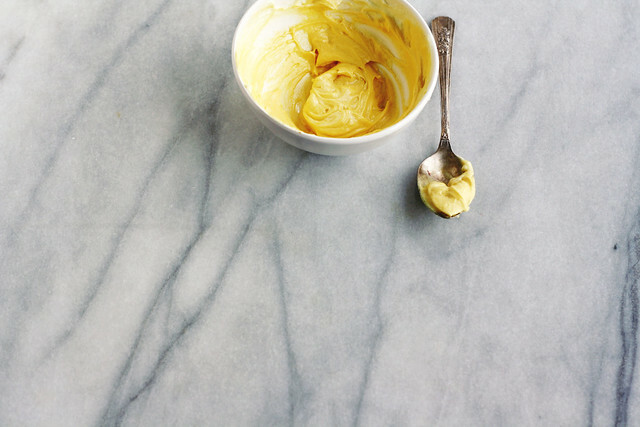 A malted or coffee buttercream would be ones I'd suggest, or even a good old whipped ganache. The buttercream can be coloured or left plain — it is naturally white, as seen in between the layers, and I used a mix of paste food colours to tint the icing for the exterior. 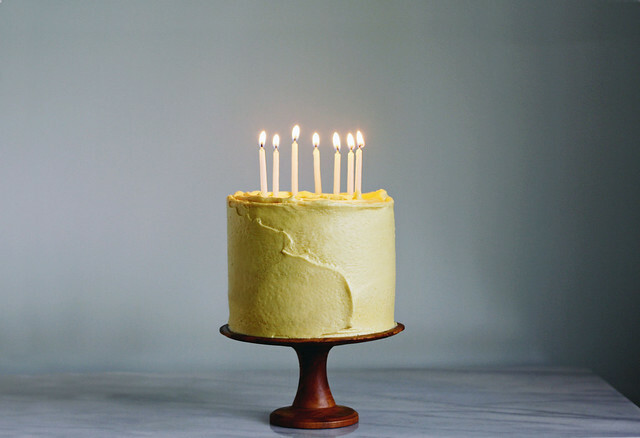 I did a piece on decorating layer cakes for Saveur last year; if you're looking for more tips, it might be of interest.